* Less than 0.5%; ^ WORDING: What is your favorite sport to follow? In general, would you describe yourself as a sports fan, or not? Four in 10 Americans intend to watch at least a fair amount of the Winter Olympics, a lower percentage than for past Winter Games. 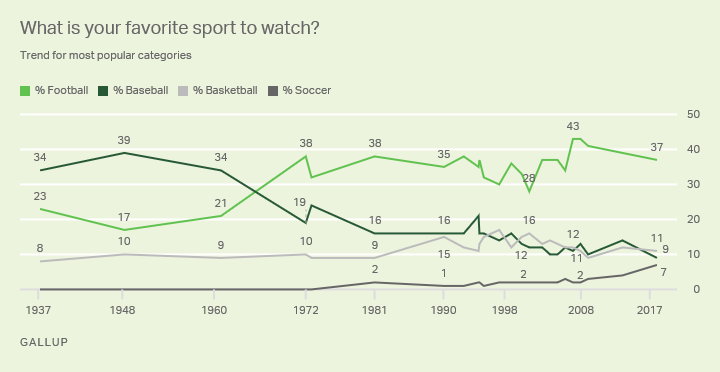 As a sport, football has taken some serious hits over the past few years, but it is still Americans' favorite one to watch. Sharply fewer U.S. adults self-identify as pro football fans than did five years ago. The fan bases in most other sports have not changed meaningfully.